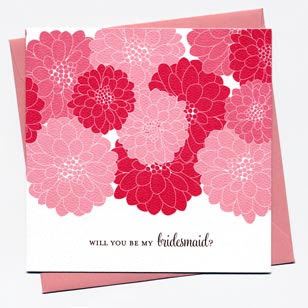 Traditionally, due to our culture, it's very critical to choose a bridesmaid. I'm not going to the detail. Anyway, the way of asking itself is complicated. I remember when my sis was asked to be a bridesmaid, the bride's mother need to talk to my mum and had this little conversation and seek agreement from my sister in order to have her stay by her daughter side during the wedding. The speech was formal and wow... I don't think I ever be able to be that polite. But hey, the above card looks so simple. I guess, this is quite a good idea hehehe... isn't it?